Since last month, I have been involved in a new initiative that uses human centered design to solve issues within Latino communities. The Keller Futures Center, an innovative program through the Grand Rapids Community College, facilitates project-based initiatives to help solve unmet and emerging needs in West Michigan communities. Previous research determined that resiliency is a key ingredient in the success of Latino youth – specifically within education. Existing as a community coalition representing education, business, non-profits, philanthropy, parents, and students, the Latino Resiliency Project will innovate for seven weeks on the topic of what drives resiliency in our youth and determine how resiliency has a positive impact on the educational achievement and overall life conditions for Latino youth. According to the design pioneers at California’s IDEO, human centered design is “a process and set of techniques used to create new solutions… by examining the needs, dreams, and behaviors of the people we want to effect”. 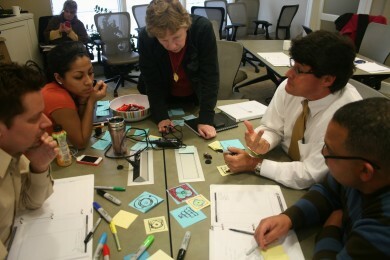 The human centered design process begins by first identifying desirability, “what do people desire?” Then solutions are uncovered through feasibility, “what is technically and organizationally possible”, and viability, “what can be financially viable?” The “sweet spot” where these three lenses overlap is inevitably where the most relevant solutions will emerge. Based on previous research by the Grand Rapids Community College and the Keller Futures Center, it was found that Latino youth in West Michigan continue to under-perform academically. Statistics indicate that Latinos within the Grand Rapids Public School district have a 33.6% dropout rate compared to 15.8% for their Caucasian counterparts. It was also revealed that there are many barriers affecting Latino academic achievement such as drugs and gang involvement. In essence, many of these teens lack resiliency – the tools to overcome difficult and trying times in life and follow through with their academics. For the past several weeks, our community coalition has been meeting twice a week and participating in several design centered exercises. During the first week, we engaged in a visual imaging process called “mind mapping”. 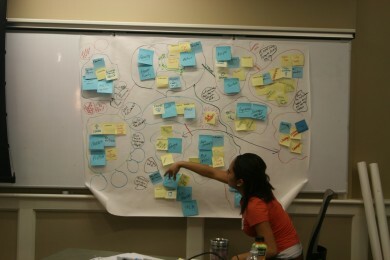 During mind mapping, participants share several ideas – writing and sketching them out on post-notes to later arrange in relevant groups with connections on a visual “map”. For week three, we conducted “field research” through interviews with local Latino families, students, and their network of supports (teachers, coaches, mentors, etc.). The research was very revealing. Yes, a few assumptions did ring true, but there were also some additional insights that proved to be quite valuable. For example, one of our research groups discovered that even though many undocumented teens shared similar experiences with immigrating to the U.S., they hardly ever spoke about them with each other as peers. This information has been synthesized and we will soon begin the process of “ideation”, brainstorming and finding the viable and feasible solutions to help solve issues related to resilience in Latino youth. It has been an interesting and thought provoking experience so far and one that has opened my mind to new concepts and culturally relevant insights with regard to Hispanic marketing. My hope is that our work will become a catalyst for future endeavors to help make our communities in West Michigan better places to live. Please check back again in the near future. I hope to write a follow up post when the work of the Latino Resiliency Project is finalized. In the meantime, please follow the project virtually through the Keller Futures Center’s website, Facebook page, and blogspot.